All roads lead to SweetWater. Travelling from Southern Ontario up to Owen Sound and Meaford is easier and quicker than you may realize. From downtown Toronto, it's only two and half hours and barely two hours from Pearson International Airport. The trip from London or Hamilton along scenic roads is only two and half hours as well. And from the Kitchener-Waterloo area, it's barely two hours. Best to head up Highway 410 to Highway 10. Just keep on 10 until you reach Chatsworth where 10 meets Highway 6. Take 6/10 into Owen Sound. Just head north up Highway 6. From K-W, head east on Highway 7 and catch 6 in Guelph. Head north on Highway 6 until you get to Georgian Bay in Owen Sound. Head west on Highway 26 and keep on going through Collingwood and Meaford right to the end in Owen Sound. 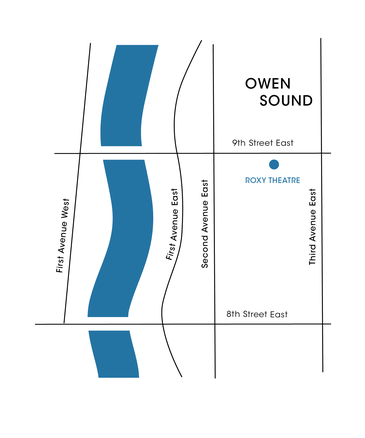 SweetWater 2016 has three key venues: the Historic Leith Church in the Municipality of Meaford, the Roxy Theatre in the City of Owen Sound, and the Harmony Centre also in Owen Sound. Here are some maps below to help you along the way. 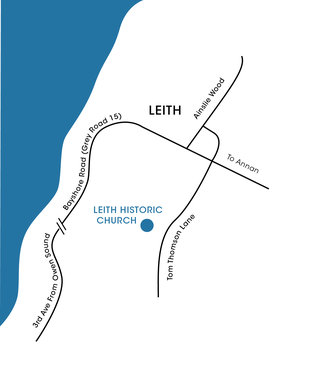 For more directions to the Historic Leith Church, CLICK HERE . For more directions to the Roxy Theatre, CLICK HERE . For more directions to the Harmony Centre, CLICK HERE.